Before a single mark was made on the Last Supper Table, it took thirty-six people to make it happen. To welcome the New Year, we reflected and composed thank you notes to those who genuinely supported this project. By the end of the first day, we ran out of stamps; by the second day, we nearly ran out of cards. We miscalculated. It wasn’t until we began this end-of-year exercise that we realized just how many people enabled us. The project had amassed a dream team that was willing to encourage and support two people who had this small idea to make a very big table. We are humbled by the vote of confidence. Every funder, affectionately dubbed an apostle or disciple to the project, contributed before there was any semblance of a table. They took a leap of faith in us and an idea, convinced that we would certainly give life to the project that we were conceptualizing. The gallery and curator that accepted us for Art Prize did the same. We did not court him with images of the work because there was no work. We offered our intentions, a description and dimensions; he offered us a space and a chance. At some point, it was estimated that over ten thousand people interacted with the table while on exhibit. We don’t know for sure. We have not counted and we aren’t sure if we ever will. 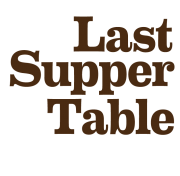 We do know that every inch of the Last Supper Table’s thirty foot surface is marked. That could not have happened without the thirty-six people that came before the Table was born. Thank you.